“Sure. How much of a hike?” she asked. She loved to hike almost as much as she loved her smartphone. So getting her to look up from the smartphone screen meant she was very interested. “Depends on which way we go. From the south, it’ll be just a short easy hike down an old road to the water. But the town won’t be there,” he teased. “Huh? Then why go? You’re not making any sense. Where did the town go? What town?” she asked. She had been exploring with him for seven years, so she knew he had a penchant for a big buildup — and usually a good reward. This time she was truly intrigued. A 1942 North Dakota Highway map shows Elbowods and Highway 8. He hauled out one of the tools the mild-mannered explorers depend on, a map. The pair liked old maps, they were most useful for adventures such as this, searching for Elbowoods. Travelers today, using modern maps don’t even know it when they drive right by the rich history of the plains. On a 75-year old reproduction of a North Dakota railroad map, he pointed out the historic town of Elbowoods. Another map showed that it was on Highway 8 where it crossed the Missouri River in the northwestern quarter of the state south of the Mountrail County town of Parshall. The pair packed a cooler with snacks and water because he promised it would be an easy hike with plenty of opportunities to sit and absorb the environment. He knew it would be quiet and picturesque. He knew they were going to a place where only a handful of people even think of going — down an abandoned highway to Lake Sakakawea. She’s a navigator, he’s a pilot. They work well together dividing their efforts. This time, they didn’t need such highly refined skills. They drove Highway 200 across the state to Halliday in Dunn County. Highways 8 and 200 share a short stretch of highway near Halliday. Highway 200 goes on its east and west direction, Highway 8 goes north past Halliday and Twin Buttes. The sad demise of Highway 8, once a major Can-Am highway is part of their story looking for Elbowoods. Highway 8 ends at the Twin Buttes Water Treatment Plant. North of Halliday they skirted ranchland with herds of cattle in the hundreds. This time of year, the weather was cool for hiking, but not very green. Permanent barricades stop traffic before going down the hill. They drove on to the Fort Berthold Indian Reservation, the home of the Mandan, Hidatsa and Arikara nation. At the Twin Buttes water treatment plant and the road stopped at barricades. “Yep, it’s blocked off. It wasn’t like this the last time I was here. So, we’ll have a bit more of a hike,” he said. That was alright with her. Being a fitness fanatic, in better health than many people half her age, she was always up for a hike. This one would be easier than many. After all, how many times does a person get the chance to hike a winding blacktop closed to all traffic except foot traffic? So, they walked. That part of his prediction was right; it was an easy walk. “I wonder why more people don’t stroll down this easy hike,” he wondered aloud. The road and the entire shoreline below are public access. The Army Corps of Engineers claims the bounding shoreline around Lake Sakakawea. Boaters tie up almost anyplace they choose. Hikers, who find access to the Corps land has unlimited terrain to explore. “Look at this, she said. I’m in a no passing zone.” She pointed at the yellow lines on the broken and covered pavement. “Oh. Okay. I was just about to make a pass at you, but I guess I’ll wait till we get home,” he joked. The old highway is clearly evident under the leaves and dirt. “Looks like someone didn’t want to follow the road,” he said as pointed down over the edge of the ancient roadbed. A crashed station wagon lays down below the road at one of the curves. Tagged rocks broadcast to the world the dates and initials of previous visitors. Tagged rocks overlook the abandoned Highway 8 below. It was easy to see that this section of highway would have been a challenge to maintain. One side, water running down the slope ate out the grade below the road. The other side dropped boulders and mudslides on the pavement. The drive to the river before it was flooded would have been a scenic route across North Dakota. At the bottom of the hill, the pavement disappeared. So, the mild-mannered explorers followed the water’s edge. Lake Sakakawea was invented in 1953 when the Army Corp of Engineers built Garrison Dam on the Missouri River and flooded out the people, farms, ranches, and towns along the river’s edge — including Elbowoods. The inlet in front of the Mild Manner Explorers was not always a water feature. It had once been a slope that the highway followed – now under water. It was easy to see where the highway had run between two bluffs, one jutting up from the north, one from the south. Before the Army Corps of Engineers flooded the valley, Highway 8 ran alongside the Missouri River toward the Four Bears Bridge at Elbowoods. This section of the highway is under water. The original Four Bears Bridge is in the background. Photo courtesy of the Tveit family. The pavement extends to the water’s edge. A bit of imagination is all it takes to envision how the highway went down to the valley to the Four Bears Bridge. The old Highway 8 lies beneath the flooded waters in this bay on Lake Sakakawea. It passed between the buttes that jut out into the water today. History lies beneath the water. The valley was an abundant farm and ranch region. It was home to indigenous people for hundreds of years. Modern convenience settled in the town of Elbowoods and a ferry connected Elbowoods on the north side of the Missouri River to the south side of the river. The Four Bears Bridge at Elbowoods crossed the Missouri River, connecting the northern and southern halves of not only the state but of the Fort Berthold Indian Reservation. Photo courtesy of the U.S. Geological Survey. Then, in 1925, a bridge replaced the ferries, the Four Bears Bridge. Its southern end was marked with a giant monument to Chief Four Bears. The official opening of the Four Bears Bridge brought excited people from all over the western part of North and South Dakota. The Four Bears Monument is on the hill above the crowd. It is now underwater. Local ranch families from the Elbowoods region would gather near the bridge for family picnics and family portraits. Photo courtesy of the Tveit family. Ranchers who lived along the Missouri River Valley would often congregate on the bridge for family photos. The bridge was an engineering monument in 1925. Flood waters begin to creep up on Elbowoods in this 1953 photo from the North Dakota Historical Society. By the time, this image was shot, much of the town had been picked up and moved. The streets no longer were lined with homes. The large brick schoolhouse and hospital are still visible. The Congregational church was picked up and moved to the prairie south of Parshall. In 1953, the Army Corps of Engineers took the Native American and white-owned land and flooded the river valley to form Lake Sakakawea, the bridge was dismantled and moved to New Town. 50 years later at its reborn location, it was deemed functionally obsolete and was replaced. The town of Elbowoods and other towns such as Sanish and Van Hook were gone forever. In 2005, just as the new Four Bears Bridge was completed, the tip of the giant monument to Chief Four Bears made an appearance. The water level had dropped to near-record lows, revealing shoreline, and other long-flooded lands. A hike out on the frozen water showed visitors just the tip of the monument that once towered over the Four Bears Bridge and the Missouri River. In 2005 Lake Sakakawea reached historic lows. By November, some of the shallow reaches of the lake were frozen over and the tip of the Four Bears Monument appeared poking through the ice. He had hiked out on the thick ice to capture the moment of the re-appearance of the obelisk. Oddly, the timing of the re-appearance coincided with the completion of the new Four Bears Bridge at New Town. The mild-mannered explorers looked for clues of a highway, or other marks of people on the move. He knew from his reading there had been a little country store at the end of the bridge. That, of course, would be under water. So, he just imagined 1940’s kids walking down the hill to the store to get sucker or ice cream cone. The Mild Mannered Explorers were quiet. Their imaginations immersed in the way it must have been 75 years ago. They returned to the truck, sat on the tailgate, rested and quenched their thirst. 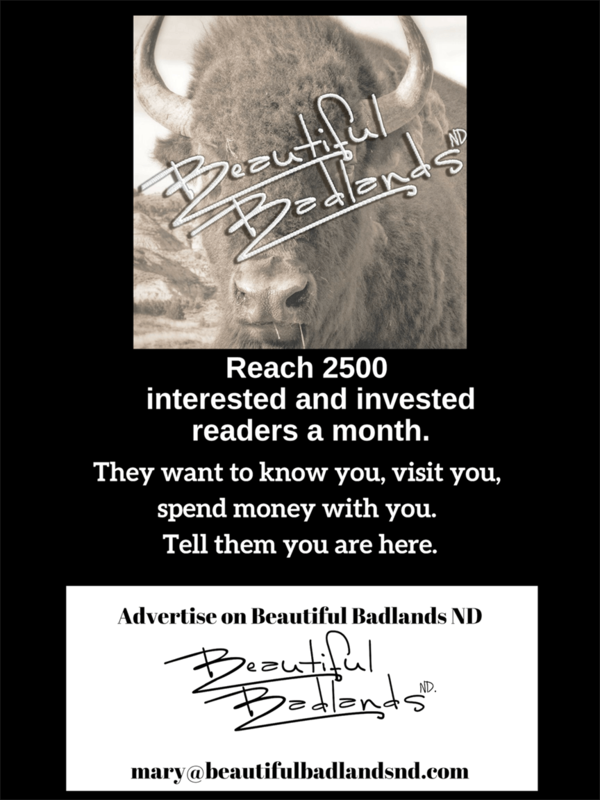 Want more stories about what to see and do in the Beautiful Badlands? Up at the top of this page, enter your email address, and you’ll be notified each week when a new story is ready for you. The Mild Mannered Explorers document their explorations — even those in the middle of a buffalo herd. Take a road trip through the interior of Western North Dakota. The Mild Mannered Explorers love to share insight and ideas for exploring the Beautiful Badlands. They’ll speak to your group. Just ask!